Looking to ditch your Behold II for something a bit more upgradable(hopefully)? Well, it seems Walmart has you covered then. 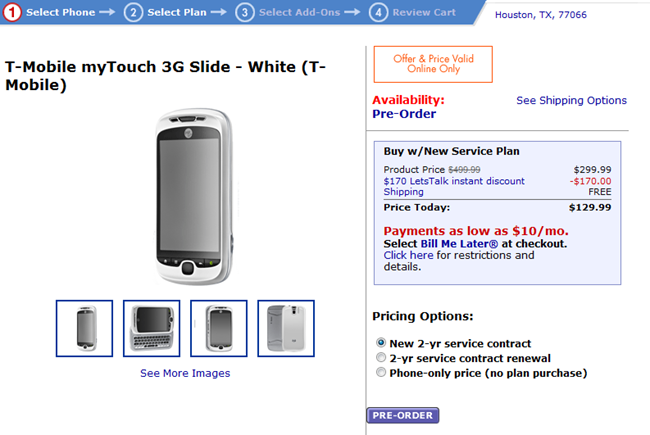 Apparently, tasty Android phones aren’t exempt from Walmart’s infamous roll backs, and they’re now offering the T-Mobile MyTouch Slide for $129.99 with a new 2 year contract – that’s $70 off the price that T-Mobile is offering. For a mid-range Android handset that’s not a bad price, especially if you’re dying to having a QWERTY keyboard, but, for me at least, the decision becomes a bit more difficult when you consider the EVO 4G is a mere $70 more. While the phone’s specs are definitely mid-range, the custom skin it’s running over top of the Android OS really sets the phone apart. You may recall that the MyTouch Slide is going to be the first phone on the market running HTC’s SenseUI revamp, Espresso. I wasn’t too thrilled with the pictures of the interface when we covered it here and here, but if you’re into bright colors and lots of bubbly buttons, you may want to give this phone a shot. At the very least it’s nice to see T-Mobile spruce up their Android line-up with something that’s not the Motorla Cliq (or Cliq XT). If you’re not too busy pre-ordering, leave your thoughts in the comments!